CyberLink has launched a major new update to its powerful webcam toolset with the release of CyberLink YouCam 6 Standard and CyberLink YouCam 6 Deluxe. Version 6.0 adds a new camera shooting mode and creative photo editing tools alongside a new free Creative Camera companion app. The latest build also introduces a new calendar view, plus allows users to organize photos using facial recognition technology. It also comes optimized for use with Windows touch screens. 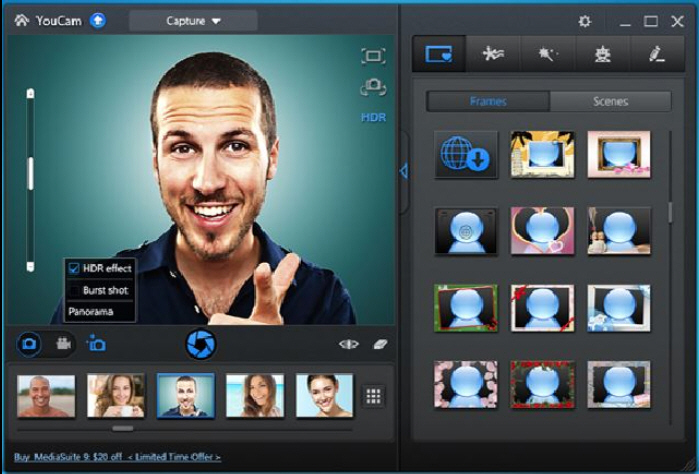 YouCam 6 adds a number of new photo capture tools, including Panorama for allowing users to take a series of shots that are subsequently stitched together to creating a sweeping widescreen vista. There’s also a new HDR capture mode that’s non-destructive and which can be switched on or off. Also added is a new Burst Mode with support for up to 10 photos in a single shot. New editing tools include Photo Frames for adding frames to images -- a number are included with the program, while more can be downloaded from CyberLink’s DirectorZone. Users can now also use Photo Presets -- again either from DirectorZone or through CyberLink’s PhotoDirector tool. Also added to the editing suite are crop & rotate and paint tools, while users can also tag photos by face, with automatic facial recognition technology providing suggestions to speed up the process. Users can now also manage their photos using a Calendar View. The update has been optimized for use on Windows machines with touch-screen displays, boasting a new Full Screen Mode view that works in a similar fashion to Windows 8’s Modern UI interface, although it’s backwards compatible with Windows 7 too. Other interface changes include a new Launcher Mode for more quickly navigating the program’s different features. YouCam 6 introduces a number of new video effect filters, including 11 new animated frames, nine new scenes, three new face-tracking gadgets and eight new particle effects. The update also features enhanced resolution support all the way up to full 1080p HD. CyberLink YouCam 6 Standard and CyberLink YouCam 6 Deluxe are both available as free 30-day trial downloads for PCs running Windows XP or later. MSRPs are $34.95 and $79.93 respectively.